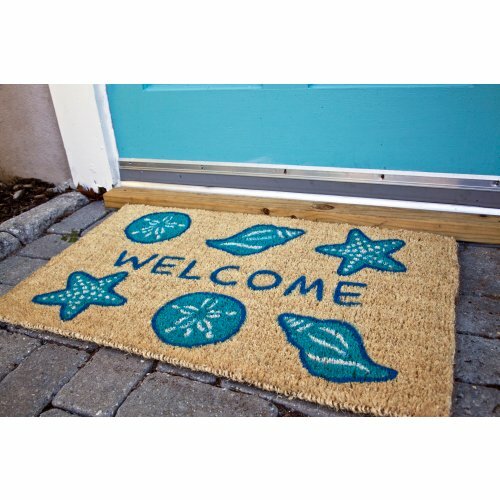 Welcome your beach guests with this sea shell door mat. Our sea shell welcome doormat is beautifully designed hand-woven doormat will enhance your entry way or patio. Our doormats are made from the highest quality all natural coconut fiber. Doormats are made from all-natural coconut fiber which is an excellent dirt-trapper; 3/4" thickness. Thicker doormats are available. This door mat is stenciled with permanent fade-resistant dyes. Featuring sea shells, starfish and sand dollar on durable doormat. Our unique outdoor doormat measures 18 in. x 30 in.